Of all dolphin species, the bottlenose dolphin is perhaps the most well-known. 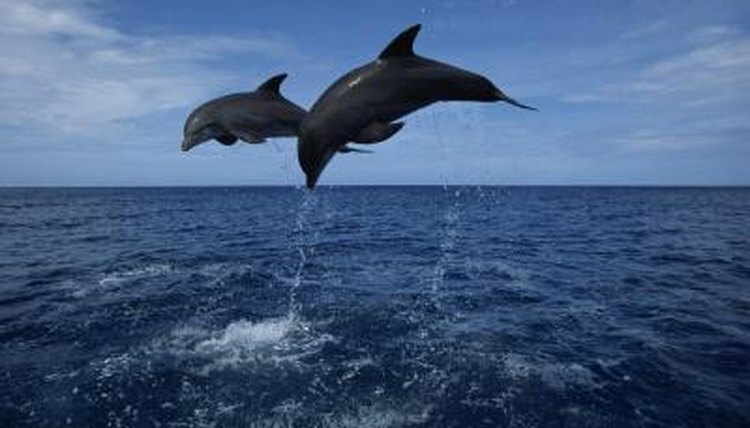 Scientists have divided bottlenose dolphins into two ecotypes, or varieties: coastal and offshore. Coastal bottlenose dolphins enjoy warm, shallow waters and have smaller bodies with larger flippers, presumably for better maneuverability. Bottlenose dolphins living within 4.65 miles of shore are classified as coastal dolphins. Coastal bottlenose dolphins feed on fish and bottom-dwelling invertebrates. Hunting strategies vary among populations of bottlenose dolphins depending upon their prey and location, but it isn't unusual for them to herd their prey against shorelines and sandbars to trap them for easier feeding. In Shark Bay, western Australia, bottlenose dolphins carry sponges in their mouth while foraging, dropping them right before feeding. Presumably this behavior protects the rostrum from rocky or sandy bottoms, or from the stingers of more prickly prey. Coastal bottlenose dolphins aren't known to routinely dive deep. Some live in habitats as shallow as 10 to 12 feet and most won't dive deeper than 150 feet, in contrast to offshore bottlenose dolphins, known to dive as deep as 1,600 feet. Coastal bottlenose dolphins' bodies aren't adapted for cold water, either. Their more compact size enables heat dissipation and they prefer warmer, temperate waters. Populations of the fish bottlenose dolphins feed on are generally denser in the more shallow coastal waters. Scientists have identified several "home ranges" of residential bottlenose dolphins including Southern California, the Gulf of California, Florida, Georgia, Texas and South Africa. One residential community of bottlenose dolphins in Sarasota, Florida contains itself to an area of 48.3 square miles. Home ranges are usually nearshore, and the ranges of pods of local residents may overlap. Bottlenose dolphins living in cooler waters such as those of the northern Atlantic or northern Pacific oceans will tend to migrate more with the changing of the seasons, where resident pods remain in place year-round. Bottlenose dolphins are both curious and intelligent. They eat between 4 and 6 percent of their body weight each day, so it doesn't take long for them to figure out where the fishing is plentiful. It's even better if a human is willing to lead the way. Bottlenose dolphins commonly follow fishing boats and feed while fishing operations are underway, sometimes to the detriment of the dolphin. Bottlenose dolphins also will follow shorebirds as they feed on near-coastal schools of fish.